How does this superhero game compare to the likes of Infamous and Prototype? There have been a surprising number of superhero games lately. 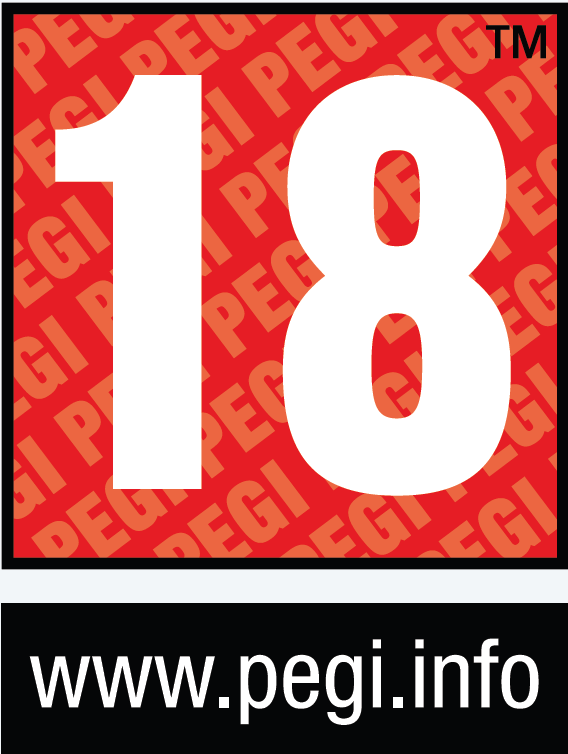 While the argument of Prototype versus inFAMOUS will probably go on for months to come there are still a few more superhero games out for people to choose from. 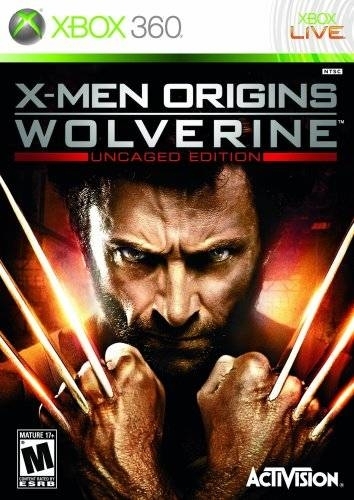 X-Men Origins: Wolverine Uncaged Edition is a game based on the recent movie, and falls into some of the obvious pitfalls that plague movie based games. 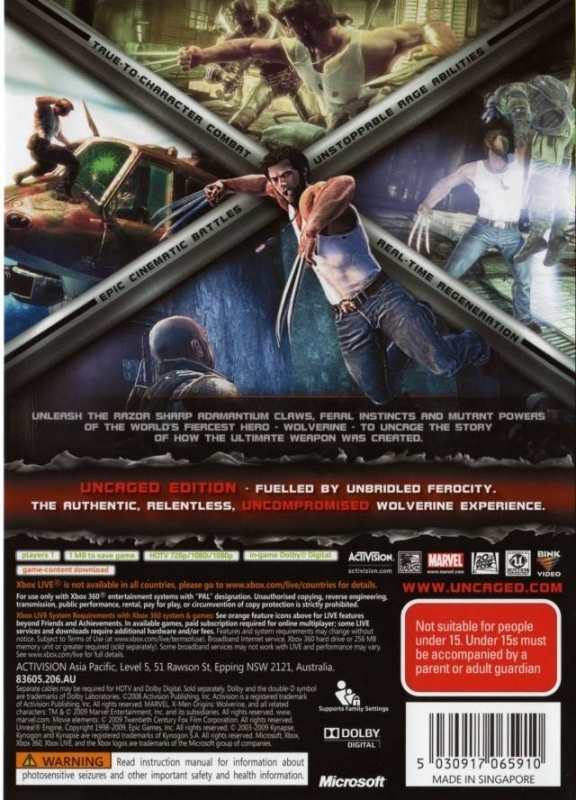 In Wolverine you play as (you guessed it) Wolverine. There are two story lines going on at the same time in the game and you will be switching between them every half an hour or so. The first story line has Wolverine working with Stryker’s team in Africa to bring down a small village of insurgents, while the second story line involves Wolverine trying to find Sabretooth who has gone rogue and is killing the old members of Stryker’s team. Neither of these stories is particularly good and there are a few plot holes which probably exist because the developers assumed you would watch the movie before playing the game, but the story lines allow you to play through some of the most memorable fights from the movie which can be pretty fun. The entire game is played in a linear fashion going from mission to mission and doesn’t allow for a lot of side tracking or exploring. 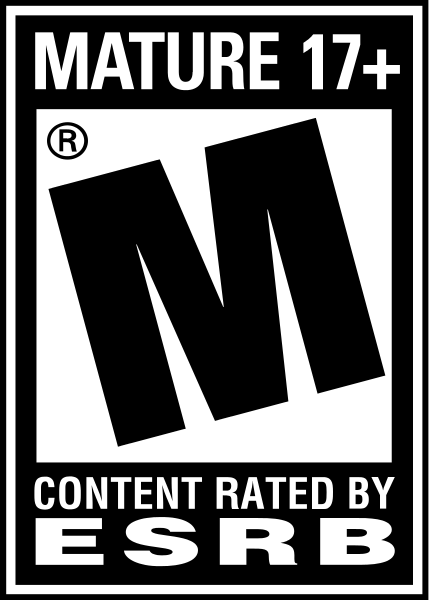 Combat plays like many beat’em up games before it. There is a light attack, a heavy attack, and a grab. You can uppercut people into the air and then follow them for an aerial combo or counter the enemy’s attack to get in a devastating attack of your own. Environmental kills are also possible by impaling your adversary on a pitchfork or a spike jutting up from the ground. One of the most useful skills is the ability to lunge. By locking onto an enemy you can lunge extremely long distances and quickly bring the fight to someone who was trying to remain in the background. This is especially useful for attacking enemies that use rifles and would prefer to keep their distance as they put you under a hale of bullets. All in all, there is enough variety in the combat that it doesn’t get boring even though there is not a lot of difficulty so you will slice through most enemies with ease. My only issue with the combat is that the larger enemies are annoyingly repetitive to fight. Most of them cannot be damaged unless you lunge at them and stab them while you hang onto their back. This is all well and good, but you have to do this six or seven times to kill each enemy, and sometimes the game will pit you against three to four of these larger enemies in a row which just serves to emphasize how repetitive it is to kill each one. This is partly abated by some cool boss battles that have you fighting Gambit on rooftops or steering Blob through a grocery store. Whenever you kill an enemy or complete a part of the story you are awarded with experience. Gain enough experience and Wolverine will actually level up gaining more health and skill points in the process. These skill points can be used to increase Wolverine’s damage, health, or the damage and time durations of his special moves. You can also collect mutagens, which allow you to pick and choose between different beneficial abilities like taking less damage or regaining health faster. You also gain combat reflexes, which are a lot like the levels you gained by taking pictures of enemies in Bioshock. By killing specific types of enemies over and over again you will slowly become better at killing them. All of these work well to make you feel stronger as you progress through the game and give you a little bit of incentive for killing a group of enemies that you probably could have just skipped over instead. One part of the combat that I really appreciated was how the developers put in the healing factor as a big part of the game. Seeing Wolverine with the skin of his face seared off and the bones jutting out from his ribcage is a cool aesthetic and then watching as his body stitches itself back together helps to make you feel like Wolverine when playing. There are two health bars in Wolverine. You have the initial larger health bar which comes back quickly whenever you aren’t being attacked and when that is completely empty you will start to take out Wolverine’s vitals which take longer to come back and will kill you if empty. Below the health bars there is also a rage bar which you gain by killing enemies and allow you to use special moves. Parts of the game are more focused on platforming, and these are really poor compared to the combat. Wolverine has strange jumping physics, which are completely unnatural and make it difficult to platform accurately. These sections of the game were annoying and taking them out completely and having an hour of gameplay shaved off would probably better serve the game. The visual presentation of Wolverine looks decent as a whole, but when you take a closer look it is extremely unimpressive. Even Wolverine’s regeneration looked pretty uninspired up close and blood seemed to have a consistency more like red jam than actual blood. One of the big selling points of the Uncaged Edition of Wolverine was meant to be the ability to actually rip enemies into pieces, and while this looks kind of cool, it doesn't really compare to a game like Afro Samurai that really went all out with that idea. People fall into pieces, but it isn't particularly realistic looking and you can't easily control how they are sliced so it doesn't add very much to the game. Waterfalls that looked like glass fakes, textures that aren’t there immediately but instead you can watch be applied layer by layer (kind of cool looking if you want to learn about game development, but not something that should be in the game) and other graphical hiccups make the visuals very unimpressive. Music in the title is quiet and pretty inconsequential. Sound effects are dominated by Wolverine’s grunting as he slices people apart and the screams of his victims, which works rather well. Voice acting was pretty well done by Wolverine but certain characters sounded extremely off. Gambit in particular had an extremely fake sounding accent that I hope was not present in the actual movie. My first play through of Wolverine took me seven and a half hours. Sadly there isn’t a lot of reason to go back to it once you are finished or side stuff to do when you are done with the main story mode. There are collectibles throughout that can unlock challenge rooms in which you have to face off against one of several comic book versions of Wolverine and defeating him will allow you to use that costume whenever you want. There are three difficulty levels, but you only unlock the hard difficulty after you play through the game on normal difficulty first, and starting up a new game on a higher difficulty level will completely overwrite all of your save data and start you from square one as far as levels and mutagens go, so make sure you have accomplished everything you want to on the normal difficulty before trying out the harder difficulty. 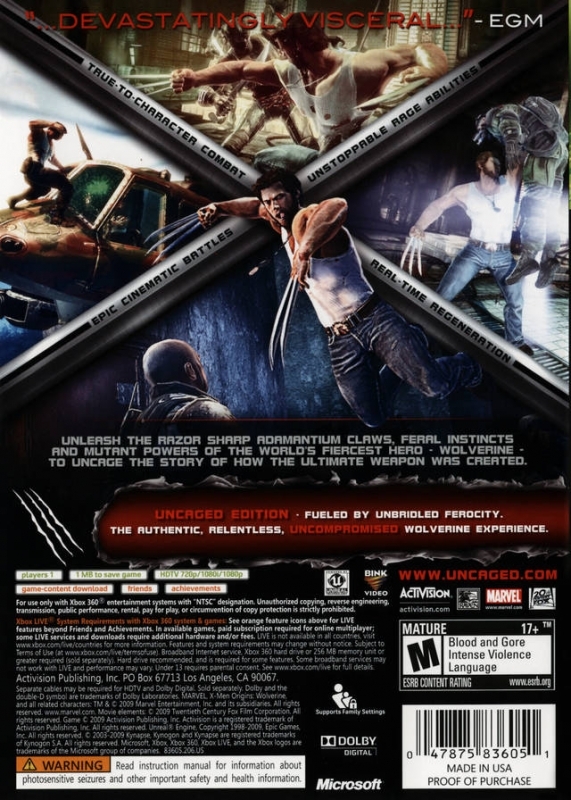 Wolverine is passable as a beat’em up title and actually kind of good as far as movie based games go. The graphics are unimpressive, platforming is painful, and some of the enemies can be repetitive, but the combat is varied enough to remain interesting through out the main story, and it allows you to play through some very cool boss fights from the movie. If you are just looking for a beat’em up in general to play, I suggest either skipping this one or renting, but if you truly loved the movie then it might be worth a purchase.